Address: Plot No. 15/1, Irwin To Osmania Masjid Road, Khaparde Bagicha, Amravati City, (M.S. ), Pin/Zip: 444 602, INDIA. We manufacture nicely Vacuum pack (200gm / 250gm) best quality Tofu (Soy Paneer) having shelf life beyond Six Calendar Months, if stored under proper refrigeration till its complete consumption. Tofu can be very well used as a substitute for normal or Cow / Buffalo milk paneer. We also manufacture Flavoured sterilised Soymilk (200ML Corked Glass Bottled) in six popular flavours viz. 1) Pineapple 2) Mango 3) Rose 4) Ilaichi (Cardamom) 5) Creamy Chocolate 6) Keshar (Saffron). Sweetened but Sugar free Soymilk in above said Six flavours can be also supplied for everybody & medically ailing patients. Shelf life of our flavoured sterilised Soymilk (200ML Corked Glass Bottled) is beyond Six Calendar Months. 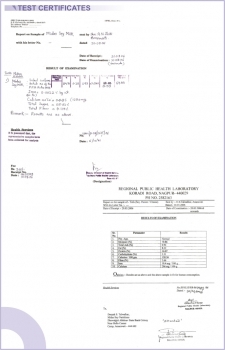 We have obtained Testing & Certification for our above mentioned Processed Soy Food Products from FDA, Govt. of Maharashtra. As per Food & Drug Administration (FDA), the certification for Tofu applies to Flavoured Soymilk also as Tofu is obtained by coagulating the Soymilk only. 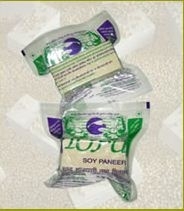 We are the only providers of Tofu & Flavoured Soymilk manufactured out of Organic Soybeans. We feel proud & also don't hesitate to claim that Midas Soy Nutritions are the best 'Tofu'�Manufacturer not only of India but of entire South Asian Sub-continent. We are also confident about better quality of our 'Flavoured Soymilk' than 'local Flavoured Soymilk' products available at Pune/ Mumbai / Nagpur & Aurangabad or any place in Republic of India. Both Soymilk & Tofu are Cholesterol & Lactose free having best nutritional & medicinal values. Both are very rich in Class-I proteins & Minerals like Calcium, Iron than any other similar type of food.